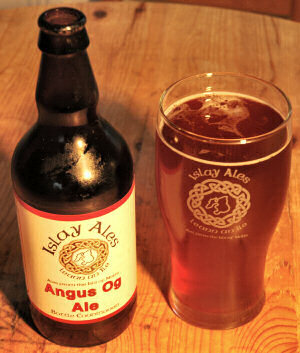 Angus Og is brewed using pale and crystal malts, water and yeast. The hops used are Goldings, Mount Hood and Styrian Golding. It is named after Angus Og, a Lord of the Isles, whose residence was on the Isle of Islay. As I've said previously I'm not very good at describing tastes, giving it a try I'd say it still has a strong taste but much milder than the Single Malt Ale. At a push I'd describe it as a 'warm' taste. A very nice beer, although it won't replace the Single Malt Ale as my favourite.